Etretat is a small seaside town about 26 kilometres north of Le Havre. 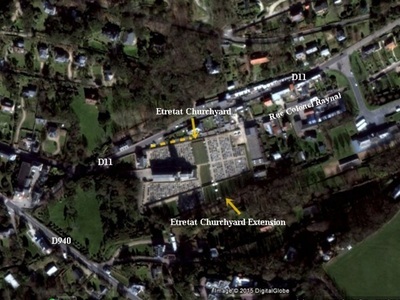 The Churchyard is on the D940 from Fecamp, and the Extension is on the south-east side of it, between the church and the railway. In December 1914, No.1 General Hospital was established in Etretat and it remained there until December 1918. In July 1917, it was taken over by No.2 (Presbyterian USA) Base Hospital Unit, but it continued to operate as a British hospital. 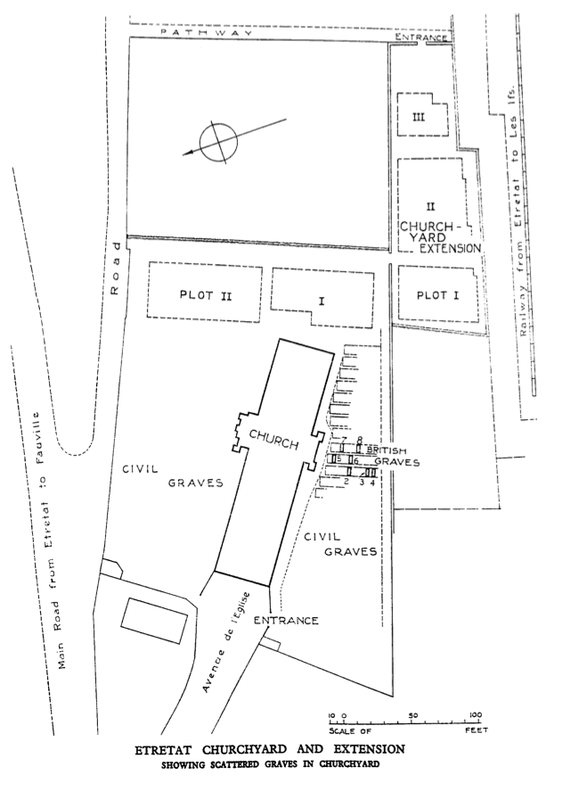 The first seven burials took place among the French civil graves but in February 1915, two plots were set aside for Commonwealth burials in the churchyard. These were filled by December 1916 and from then until December 1918, the extension was used. 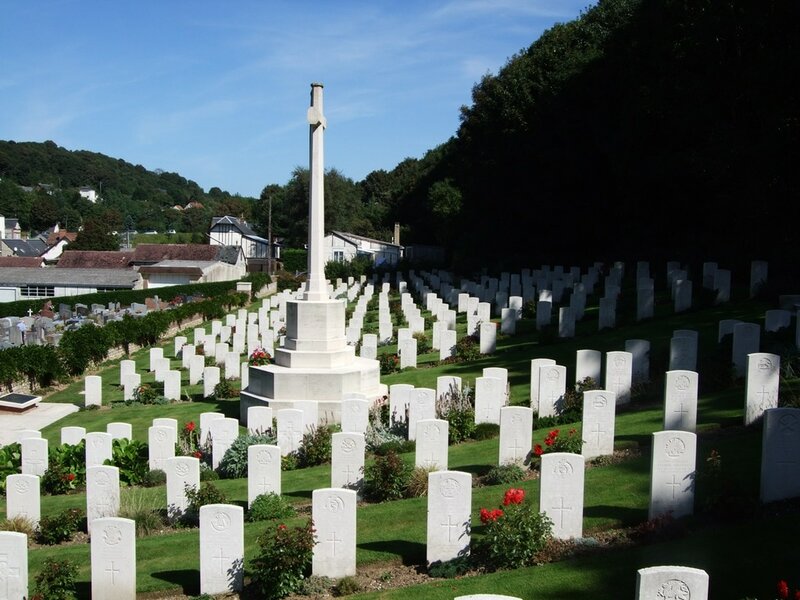 ETRETAT CHURCHYARD contains 264 Commonwealth burials of the First World War and one German grave. ETRETAT CHURCHYARD EXTENSION contains 282 First World War burials and four from the Second World War. There are also 12 German graves in the extension. 2168 Private George Geal, 59th Bn. Australian Infantry, A. I. F., died 2nd June 1918, aged 22. Plot II. D. 16. Son of Albert and Alice Geal, of Spring Vale Rd., Tunstall, Victoria, Australia. George Geal was born in 1895 in Preston, Victoria, to Albert and Alice (nee Huggett) Geal .He had five brothers and four sisters. His brother Albert Geal also of the 59 Bn Australian Infantry died on July 19, 1916, in France, at the age of 27. His body was never found and he is now commemorated on the Memorial at Fromelles in V. C. Corner Cemetery. 10th May 1917, aged 27. Son of John and Ann Fitzgerald, of Sunderland. Son of William and Annie Harriet Holding, of Yarra Glen, Victoria, Australia. A 20 year old grocer from Yarra Glen, Victoria when he enlisted and embarked for overseas with the 10th Reinforcements from Melbourne on 7 March 1916 aboard HMAT Wiltshire. 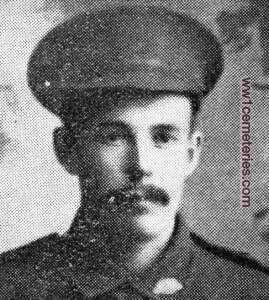 While serving with the 21st Battalion, he was wounded in action on 24 December 1916 near Fricourt, France and later died of those wounds on 16 January 1917. He is buried at the Etretat Churchyard Extension, north of Le Havre, France. Wilfred Harold Ramsden, D. C. M., M. M.
9th November 1918, aged 29. Son of Alfred and Elizabeth Ramsden, of Ascot St., Victoria Park, Western Australia. Native of Elsternwick, Melbourne, Victoria, Australia. His headstone bears the inscription; "Those who love you best miss you most." 9th January 1917, aged 32. Son of Alfred Henry and Mary Sheppard; husband of Rose C. Sheppard, of "Auburn Heights," Auburn Rd., Auburn, New South Wales, Australia. Native of Elstead, Surrey. His headstone bears the inscription; "Though your resting place is far away, our thoughts are with you ever." Over the centuries the history of our country has been littered with governmental mistakes and mishaps. How refreshing then, that in 1908 the new Secretary of State for War, Lord Haldane, undertook reforms in the army which were to have far-reaching effects. He established a new part-time army of volunteers who were fully-trained soldiers in full-time jobs and who were organised on a county system. This Territorial Force became jokingly known as the 'Saturday Night Soldiers' as the young men who joined were taught to shoulder arms at weekly meetings and drills. They even attended summer camp and many 'Terriers' were at camp when war was declared in August 1914. In 1909, with unbelievable foresight, the War Office issued a 'Scheme for the Organisation of Voluntary Aid in England and Wales' which recognised the need to provide sufficient medical backup to supplement the Territorial Force in the event of war. Ultimate efficiency would not be realised unless all voluntary aid was co-ordinated and the Territorial Associations were directed to entrust the work to the British Red Cross which had also adopted the county system of organisation. They joined up with the Order of St John of Jerusalem and thus, the organisation known as the Voluntary Aid Detachment was born. Detachments were divided into those for men and those for women. Men's detachments numbered 56 lead by a commandant and comprising a medical officer, a quartermaster, a pharmacist and four section leaders each responsible for 12 men. They were usually responsible for transport and converting suitable buildings into hospitals and clearing stations and would also act as stretcher-bearers and male nurses if required. After enrolment the men studied first aid and were lectured in the various duties connected with transport and camps. The women's detachments were less than half the strength of the men. They were also led by a commandant, who could either be male or female and not necessarily a doctor, a quartermaster, a trained nurse as a lady superintendent and 20 women of whom four had to be qualified cooks. It was felt the women's detachments would be better served to the 'less arduous' task of forming railway rest stations where they could prepare and serve meals for sick and wounded soldiers. It was obvious they were seen more as domestic assistants than nurses! However, they were given lectures in first aid, home nursing, hygiene and cookery and were occasionally given training in infirmaries. 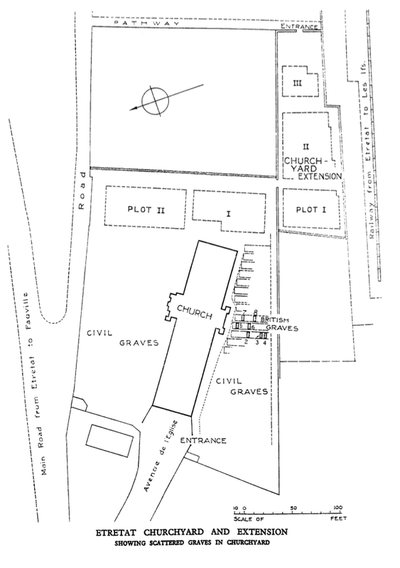 They were taught to identify suitable buildings for use as temporary hospitals and how to obtain equipment and supplies. Within a year membership numbered somewhere around 6000 with over 2,500 detachments. These numbers increased considerably after the outbreak of war in 1914 and numbers rose to over 74,000, two-thirds of whom were women and girls. As men were called away to answer their country's call it fell upon the women to fill their shoes in whatever way they could. Initially it was mostly middle-class women who were eager to 'do their bit' and they took on roles such as ambulance drivers, welfare officers, fundraisers, civil defence workers and even letter writers for the illiterate. It is interesting to note that the novelist, Agatha Christie was a VAD and worked in a hospital pharmacy where she learned about poisons! The military authorities were reluctant at this early stage to accept VADs on the front line, perhaps thinking that the battlefield was no place for a woman. However, this restriction was lifted in 1915 and women volunteers over the age of twenty three and with more than three months experience were allowed to go to the Western Front, Gallipoli and Mesopotamia. Eventually VAD's were also sent to the Eastern Front. Before the outbreak of war some VADs had taken short nursing courses for which they were awarded certificates. Qualified nurses had undertaken three years training and were understandably suspicious of these short courses, referring to the volunteers as 'ignorant amateurs'. Quarrels broke out and there are even reports of open conflict before the new spirit of unity in time of war was felt and working together for mutual benefit was the order of the day. The VAD's became very active in the war effort using influence to transport themselves to the conflicts in France to care for the sick and wounded and thus carving out for themselves a clear role as nurses or orderlies in hospitals at home and in the theatres of war. By 1916 their numbers had increased to 80,000. In 1917 clear regulations were laid down by the British Red Cross which governed the employment of nursing VAD's in military hospitals. Age limits were specified and volunteers should be between 21 and 48 years of age for home service and 23 and 42 for foreign. They were to be appointed for one month on probation during which time they were assessed for suitability by the matron. They then had to sign an agreement to serve for six months or the duration of the war, at home or abroad. Salary would be £20 per annum rising to £22.10.0 for those who signed on for another six months at the end of their current contract. Increments of a further £2.10.0 would be paid every six months until probationers reached the maximum of £30 per annum. It was also laid down that VAD's should work under fully trained nurses with duties including sweeping, dusting, polishing, cleaning, washing patients' crockery, sorting linen and any nursing duties allotted by the matron. Meanwhile, VAD hospitals were being set up in Blighty and were mostly located in large houses loaned for the purpose by their owners. Gustard Wood at Wheathampstead and The Bury at King's Walden are just two Hertfordshire premises used. The Council School in Royston and the former mental hospital, Napsbury in Colney Heath are examples of institutes put into service. These hospitals received the sum of three shillings per day per patient from the War Office and were expected to raise additional funds themselves. As everyone was keen to be seen to help the war effort this was not difficult and local newspapers regularly featured lists of donations received - obviously anonymity did not seem to be the case! Many women returning home after the conflict ended undertook formal nurse training and registration with the General Nursing Council. Others tried to pick up the threads of their former lives. What must be certain is that life could never have been the same for any of them again. The sight, smell and fear of war must have been imprinted on every mind bringing about a change in the lives of women which would grow and grow over the following years. Our thanks to Janine Lawrence for permission to use this article.